The assumption that the environment is an essential part in recovery from disease has recently gained increased attention among healthcare professionals. Scientific findings showing that environmental sources, such as air quality, lightening, smell, music, art and architecture can improve recovery and well-being in clinical settings have led to new ways of thinking about the lay-out of health facilities. Music interventions in particular have received extensive scientific interest. 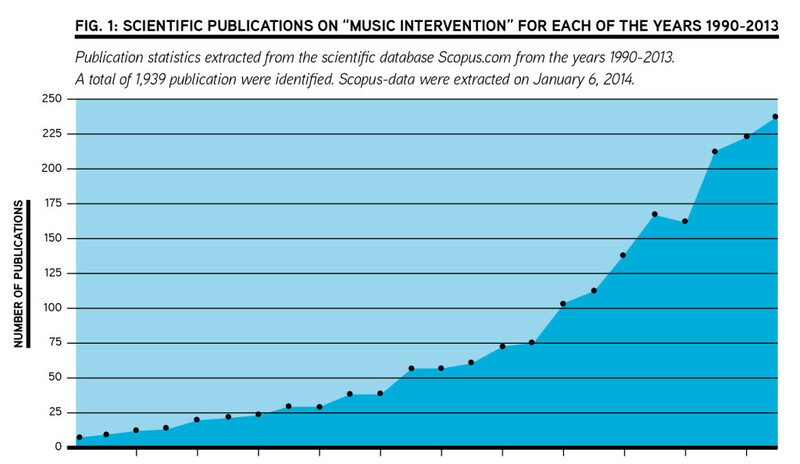 When doing a literature search for scientific publications1 which include the word “music intervention”, only 10 papers were published during 1990, 40 papers in 2000, and a total of 235 scientific papers in 2013 (Figure 1). Indeed, a meta-analysis from 2012 found that, compared with other environmental adjustments, music was the most widely studied and most effective intervention in hospital settings (Drahota et al., 2012). Thus, interest in integrating music into healthcare settings is blooming.